Synonyms: Uwasa, Rumors, Ano Natsu, That Summer, Osaka Life, Yoku Aru Hanashi. Through piano lessons a love slowly grows between the cool adult, Goshima-sensei, and one of his students, a high school girl named Kae. The most popular stylish love romance. 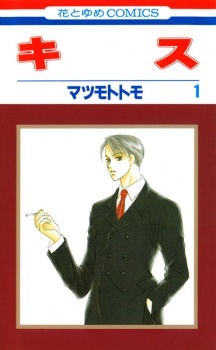 Volume 6: Yoku Aru Hanashi. Kiss is my favorite manga currently. But in no way am I going to give a bias review so I'll be completely honest of my reasonings and the flaws. First of all, when you first read the synopsis and start off the first pages you may think this is another one of those mangas-the stereotypical romance manga where two people are completely unaware of their love for each other until the very end, but Kiss is nothing like that at all. Right from Chapter 1 and throughout the following volumes, Matsumoto emphasizes the struggles after struggles they go through, which is what makes me feel so interested when reading-not because of the drama, but because its realistic. It is very realistic the issues they talk about and go through, which is why I feel such a connection with the manga. I think this is Matsumoto's gift as a mangaka. Her artwork is not the best I've seen but the way she chooses the wording and shading, it makes a simple stare from the two protagonists have a deeper meaning and you can immediately feel the passion that the characters have. I think the plot is pretty typical and common, but it is the characters that make me so fond of this manga. Matsumoto has a way of building up the personalities of her characters, which makes them appear, like I said before, REAL. The way she subtly emphasizes their feelings makes the reader think about the true meaning of the words and the expressions. I feel like I know the characters personally, so I keep coming back for more. This is truly one mangaka that I respect and look up to. Kiss is a really good romance with a skillful mangaka behind the scenes. Matsumoto Tomo is a skillful mangaka. However, this is one of her earliest works and the art is not as good as it gets in the later chapters. Around chapter 20, it becomes much more anatomically correct. I've always though Matsumoto's style is subtle, yet expressionistic and powerful in its simplicity. I love the laid-back, naturalistic style of hers. She has an eye for movements and captures the characters perfectly. The characters are not completely original, unfortunately, but they do work for the story. The heroine is a girl with a strong will, and you can really sympathise with her as she isn't forced to act as a damsel in distress. The piano teacher is a bit aloof with a cold air around him, but slowly warms up her. It is really enjoyable: there is always something going on and it's great to see how their romance develops. It feels like your first love, fragile and uncertain. It's a lot of tension between the two of them and the suspense adds interest to the story, making you want to continue to read it. So yes, the enjoyment is very good. Overall it's a special manga to me since I'm very fond of Matsumoto's style and her other mangas. Still, if you're a fan or not you should give this a try. Please forgive the early chapters since they aren't as good as the later ones, in the art department. Mod Edit: This review has been moved, due to That Summer and Kiss being merged. I was a nice read. It wasn't the best one-shot I have read but it was something different. The art wasn't really good, there wasn't too much effort put into it. Very simle nothing flashly. The characters didn't really stand out either but they were real, they didn't overthink things like other one-shot characters. The story though was really nice, an army brat and japaness girl who just meet. Their bond grows and it because a friendship and into a crush. In conclusion I can say that reading this wasn't really bad. This is a very closlely related to life story. It's not really a waste of time just try it and if you didn't like it, then so what you wasted 20 minutes.